Her status update caught my eye, but only because I'm used to seeing this friend write about her role in the latest play at the community theatre, or post about something hilarious one of her kids said. She doesn't post much of anything political, and I can't remember ever seeing her complain. But this post was different. Kelly had just received a new premium quote to cover her family, which includes her husband and their five children. "...If you are a hard working, self employed family with a house full of children then you can get screwed just like us! I am so glad everyone gets healthcare now, OH WAIT! Except for those who opt out and get fined the $95.00 a year because they can't afford their premiums. I guess they don't get "affordable" healthcare either. Don't break a leg folks..or worse...This tirade brought on by the fact that I just got a premium quote of up to 1254.00 a month (not including dental) and I am mad about it." That wasn't the only quote she received, she shopped around. The lowest she could find was over $1,022 a month, and what she didn't mention in her self described "tirade" is not only is their insurance premium increasing by several hundred dollars a month, their deductible is doubling as well. Each family member will now have to meet a $6,350 deductible before insurance kicks in. Kelly's husband owns a machinery businesses and is the sole provider for their family. They don't live an extravagant lifestyle and they've made a lot of sacrifices in order for Kelly to stay home and raise their children. I asked her what this costly increase means for their family. "Financially this will be devastating for us. We will have to lower our grocery budget and who knows where the money will come from to keep this family clothed. Feeding and clothing five kids is hard enough, but there are activities and other things they all want to be a part of that will have to be passed over because we simply can't afford it. Future plans for house upkeep and family vacations will all be put on the back burner as well. Basically our quality of life will be diminished." She went on to talk about the anxiety the situation has caused. "Our coverage was never really good at the lower rates. But now we have to pay more for the same or worse insurance. It actually causes me anxiety and makes me feel depressed when I try to think about where the money will come from." In the past few weeks I've noticed several of my friends posting about huge increases in premiums and deductibles while also seeing a decrease in their coverage. Many have reached out to me via social media or email to share their stories. Another friend, Michelle, recently commented on a Facebook status stating that the increase in premiums forced her to go back to work full time. 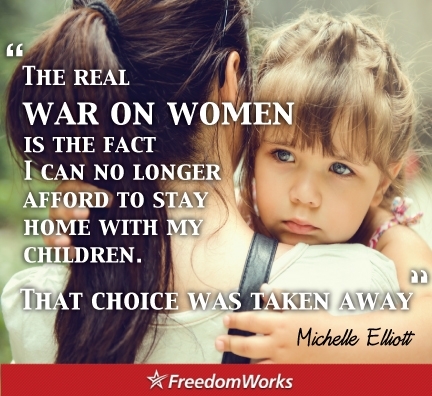 "The real war on women is the fact I can no longer afford to stay home with my children. That choice was taken away." Only four years ago Michelle had a comprehensive plan covering her and her two young children for $181 a month, and a low $500 annual deductible. In 2010 that plan jumped to $700 a month and the deductible doubled. At the end of that year she was notified that her rates were about to increase by as much as 60%. "That's a mortgage payment for us. My husband's job provides insurance but adding me and the kids raises the cost to over $1000 a month. It's just not doable." She had to make the choice to either find a full time job that provides insurance or go without coverage. Today, both her and her husband work full time primarily to afford a plan that carries a $5,000 per child deductible. Like Kelly's family, they don't qualify for subsidies under the income guidelines of ObamaCare. The promises of lower premiums, more choices, and being able to keep your plan, made to millions of Americans by President Obama continue to be broken by economic reality. It sounded to good to be true, and it is. Neither family I spoke to can afford insurance now that the "Affordable Care Act" is in effect. These are just two families who have had their lives negatively impacted by ObamaCare. Unfortunately, there are nearly six million people who have had their plans cancelled already, and according to some estimates, tens of millions more to come. What will your family be forced to sacrifice? How will your family cope with dropped coverage and skyrocketing costs under ObamaCare?